Tim J. Finn was born in Boston and continues to call the area home sweet home. Always drawn to the speculative genre, he penned his first story, an origin tale for the Aurora model kit The Forgotten Prisoner of Castle Mare, while enrolled in Catholic middle school. The good nuns no doubt felt his literary tastes confirmed the widely heralded conviction regarding the inherent suspicious and sinister nature of a left handed person. 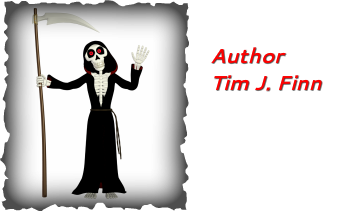 Tim scored his first story sale, an adventure mixing voodoo created zombies with an egotist's grisly comeuppance, while in high school. He placed a number of other pieces over the next few years before taking a slight creative hiatus while earning a Bachelor of Arts in English at Grinnell College. Tim's post graduation jobs have included radio announcer, busboy, office temp, copywriter, short order cook, data entry operator and front desk receptionist. He is a member of the New England Horror Writers and the Horror Society.